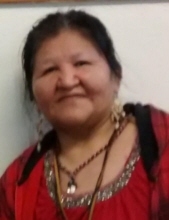 On February 1, 2019 Aawok JoAnn (Charles-Scott) Moore went home to be with her parents Aawok Robert Charles and Aawok Ada Waukell Charles and children: Brenda, Byron, Jesse, and grandson Dimitry Steele and Zarian. JoAnn was born on December 10, 1948 in Klamath she grew up in Del Note and Mendocino Counties. She is survived by her children Mary, Ronnie, Vlayne, Merle, Rose’el, John and Fannie. Her siblings Jeannette, Arlen, Fern and Lloyd. Grandchldren: Nicole, Misha, Alexis, Alexandrea, Raven, Athena, Ryon, Byron, Talia, Robert, Den’e, Wautec, Ira, Weconah, Jesse, Waukell, Donoa, Tamesha, Makeala, Aliyah, Dristan, Jordan, Cheyenne, John Jr, Jesse, Demitri, Juan, Frankie, Ricky, Les, John and Tyren. Aawok JoAnn was a well known basketweaver, speicifically for Medicine baskets, beading and Baby Rattles. She loved going to Bingo with Jeannette, Delray, Vlayne, Rose’el and Donoa. She also loved going to Dart night with Leanna and Jerry Berghagen at the Country Club. Aawok JoAnn was a fisher woman most of her life and loved canning fish with her son Merle. She was a very loving Mother, Grandmother, Auntie and Sister. She loved her family very much and always had a smile on her face. Aawok JoAnn had a huge heart and raised Micah, Kim, Frannie and Tyren. She always got everyone gifts and loved baking on the holidays. She loved watching and participating in her grandchildren’s sports. She was proud of her grandchildren’s achievements and participating in their culture and ceremonies. Aawok JoAnn loved watching football especially her 49’er Team. She loved making Jello for “Big Ira” everyday. Aawok JoAnn was very loved and will be deeply missed by many other family members and friends. A boat ride immediately following church services, will begin at 12:00 leaving from Requa Boat Ramp and ending at Waukell Cemetery. Reception after cemetery services will be at the Yurok Tribal Office at 1:00 pm. To plant a tree in memory of JoAnn - Moore, please visit our Tribute Store. "Email Address" would like to share the life celebration of JoAnn - Moore. Click on the "link" to go to share a favorite memory or leave a condolence message for the family.